In a year that has seen Alan Turing receive an official royal pardon and a blockbuster film about his achievements, it seems somewhat surprising that there aren’t more shows at this year’s Fringe about him. However, this work from Welsh company Scriptography Productions is absolutely sensational, and features on of the finest acting performances I have ever seen on the Fringe. The play starts with Turing as a schoolboy, and goes on to show his first love, his work at Bletchley, and the relationship that would see him found guilty of gross indecency. It’s certainly not afraid to be bold, and at times brutal, focussing primarily on Turing’s sexual identity and personal life. 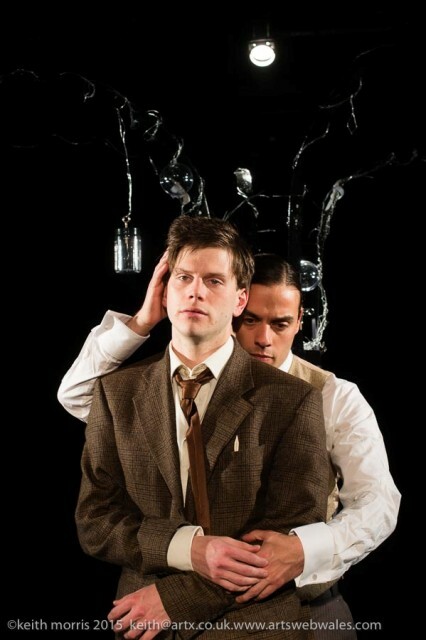 Turing himself is played by Gwydion Rhys, who brings so much emotional depth, softness and realism to this disturbed character that I genuinely wanted to jump on stage and stand in the way of him being chemically castrated in the play’s final scene. 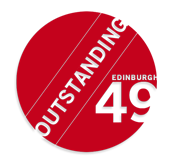 It’s a controlled and commanding performance without ever being over the top, and well worthy of a Fringe award. The supporting cast of Rick Yale, Francois Pandolfo and Robert Harper, who between them play 14 characters, also deliver highly commendable performances. The production moves at quite a fast pace, but it’s the moments of stillness and sensitivity, which to me were the most powerful. In particular, watching Turing’s mind whir as he develops his theory for the first computer, and his damning confession and inability to lie while in the witness box are utterly compelling. While I wasn’t 100% convinced by snippets of the high energy quiz show scattered throughout, which posed questions to reflect theories developed by Turing, these sections did serve as a stark Brechtian contrast and awakening to his manipulation and ultimate downfall. I would have liked to have seen a closer integration between these sections and the genuine interrogation he received in the courtroom to really complete the circle of that idea. It was also disappointing for me that this show was only an hour long, I could easily have stayed engaged for two, and would have welcomed more exploration into some of the other themes – gender identity, machines vs humans, and more cultural context of the period of his life. In saying that, for the length it was, I think it was written and structured excellently, with an engrossing narrative and compelling action. This show is a must-see. Smother is a dance piece that loosely covers the theme of relationships, in particular those among gay people. It’s not overtly “gay though”, and doesn’t lose itself in stereotypes, making it very accessible to a wider audience. What is more prominent is just how two people can meet, fall in love, and be affected by an affair, regardless of gender or sexual orientation. The choreography throughout is outstanding, from a full-on hip hop opening number, to more sensuous contemporary sections it explores the party lifestyle, expectation, friendship, infidelity and intimacy. There is a great balance between the big unison group numbers and the more emotive solos and duo sections, while one dancer’s frustration to find anybody to love is made all the more powerful by the constant ignoring of her plight of the performers who walk past her time and again. Particular highlights include an example of the first awkward encounter in the bedroom getting tangled up in one’s clothes, through to the very emotive trio at the end of the piece, showing how a lover comes between the lead couple to drive them apart. Canon is used very effectively throughout the piece (with one dancer often doing the reverse of their partner), and is powerful enough to show similar thinking, but an ability to communicate it directly. For a high octane dance piece, performed by a troupe of incredibly lithe and athletic young dancers, it’s also very mature. The overt sexual movements are kept to a minimum, while everyone stays, for the most part, fully clothed. The power comes from engagement between the dancers – their synchronicity (or otherwise) and proximity to one another is enough to show how close they are emotionally and sexually. It’s balanced, detailed and very relatable. While it’s not quite as hip-hop throughout as the billing suggests (the music perhaps a stronger influence than the choreographic style), the dancers are just as talented at the fast pops and locks as they are with the leaps and lifts in the more contemporary sections. Speaking of the music, it’s a generally a very modern and young selection, at times very lyrically overt, perhaps to aid the narrative, but very effective all the same. A very impressive full length debut from 201 Dance Company.